The Callaway Apex CF 16 Iron is precision engineered with industry-leading, category-defining Cup 360 Technology to give you exceptional, consistent ball speed across the face and playability in a forged players iron. The progressive design creates scoring performance through the set, from your long irons to your short irons. Callaway’s high-tech, multi-piece construction provides a combination of distance, feel, and control that can suit any player, and the extremely soft feel comes from quadruple net forging and mild carbon steel. When you combine all of these advanced technologies, along with the classic, authentic shape, you have a forged iron for all golfers. 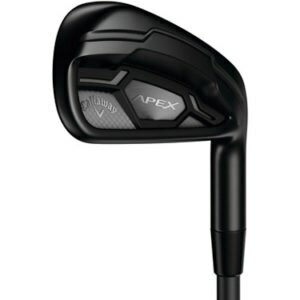 The new Apex Black Irons are precision engineered with Callawayls industry-leading, category-defining 360 Face Cup technology to give you exceptional, consistent ball speed across the face and playability in a forged players iron. And Callaway has added a sleek all black look with a Satin Black PVD finish and premium shaft options, with a vast no upcharge list to customize your set. When you put the Callaway Great Big Bertha Driver in your hands with all this technology, you’re living by one rule: “Leave no yard behind.” The Great Big Bertha Driver is back, and it represents the next frontier in driver design. This advanced adjustable driver has a light, fast, stable chassis unlike any other driver we have had before. It’s a technological breakthrough, and it’s built to get the most distance for all golfers. The Callaway Fusion Pro has an advanced multi-material construction that will make you rethink your old glove.